Power went out in buildings on Marquette University’s campus for the second time in one week. 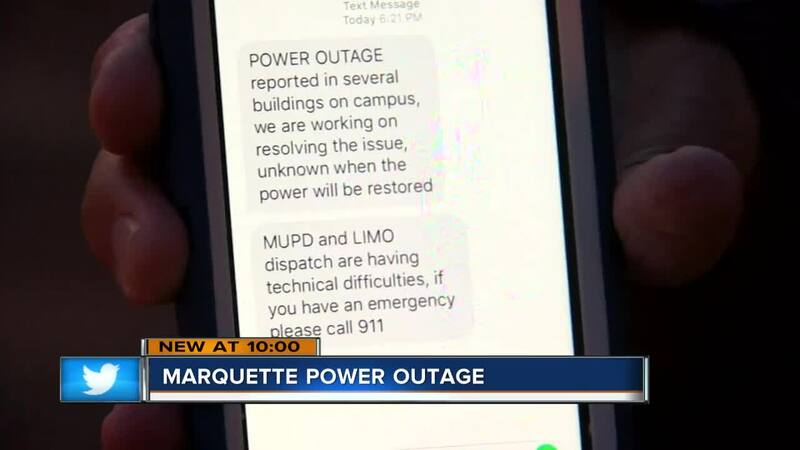 MILWAUKEE -- Power went out in buildings on Marquette University’s campus for the second time in one week. A spokesperson for WE Energies tells TODAY’S TMJ4, Saturday evening’s outage stemmed from a problem with one of the underground cables. Students got alerts on their phones at about 6 p.m. that several buildings lost power on campus and police dispatch was down. It impacted three buildings in the area of 17th Street and W. Wisconsin Ave. for a couple of hours, including dorms and the “Commons,” the dining hall that offers food 24/7. Students said it was frustrating that the elevators weren’t functioning. “I was coming back to the dorm. There were a few kids that were stuck in the elevators. I know that was an issue but they got out,” student, Daniel Chee said. The outage created a scene outside. “As we drove up Wisconsin Avenue I saw the flashing lights. I said there’s some police activity outside my building,” Vice President for Mission and Ministry Father Fred Zagone said. He was heading back from dinner when he noticed his residence had no power, something he also experienced just a couple of days ago in a different campus building. Losing cable was the main concern for many students. “It’s really inconvenient because I can’t watch March Madness and the Michigan game is on and I need to know if my bracket’s doing well,” student, Patrick Barnett said. WE Energies said the outage from Thursday only affected two buildings, and had to do with a different underground cable. They’re still investigating what happened Saturday night.